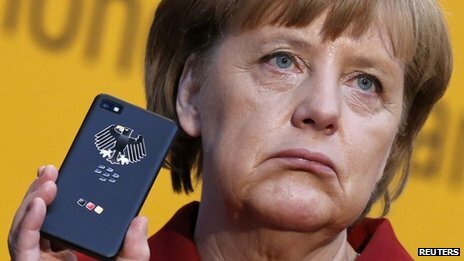 "no single Plan Z document was ever compiled and no emails were exchanged between participants"
Angela Merkel was handed the piece of paper Barack Obama had just passed around. A full-scale endorsement of a plan for the European Central Bank to protect eurozone countries when they came under attack from financial markets by automatically buying their bonds. In retrospect, it marked the beginning of the final turning point in the crisis. The /German Constitutional/ court concludes that OMT violates the German constitution. It accuses the ECB of making a power grab by extending its own mandate. It says the scheme endangers the underpinnings of the eurozone rescue programmes. Worse, it says OMT undermined deep principles of democracy. Tim Geithner recounts in his book Stress Test: Reflections on Financial Crises just how far the EU elites are willing to go to save the euro, even if it means toppling elected leaders and eviscerating Europe’s sovereign parliaments. "They wanted us to refuse to back IMF loans to Italy as long as he refused to go," he writes. Geithner told them this was unthinkable. The US could not misuse the machinery of the IMF to settle political disputes in this way. "We can't have his blood on our hands".The revelations about EMU skulduggery are coming thick and fast. Tim Geithner recounts in his book Stress Test: Reflections on Financial Crises just how far the EU elites are willing to go to save the euro, even if it means toppling elected leaders and eviscerating Europe’s sovereign parliaments. Geithner told them this was unthinkable. The US could not misuse the machinery of the IMF to settle political disputes in this way. "We can't have his blood on our hands". Any attempt to set a single interest rate for 17 politically and fiscally sovereign nations is almost by definition doomed to failure. Perpetual crisis is more or less guaranteed. 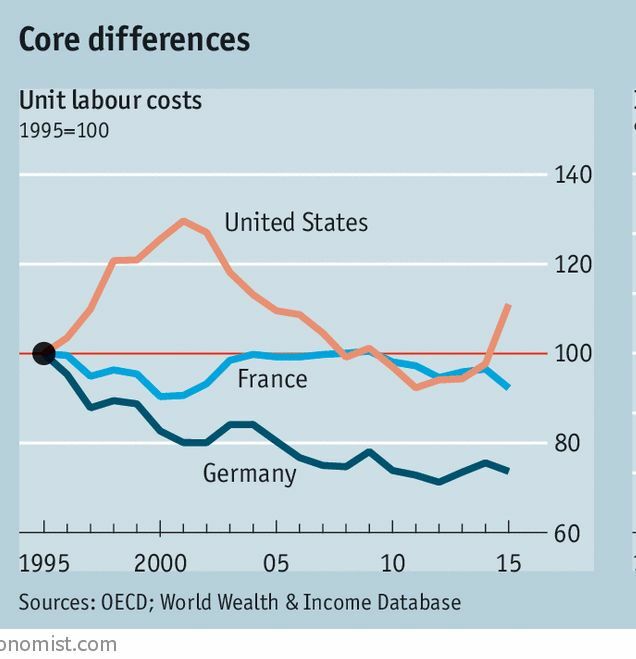 Germany’s path to competitiveness: cutting the cost of labour. and exports have been its sole consistent source of growth in that period. But low wages are not the basis on which a rich nation should compete. 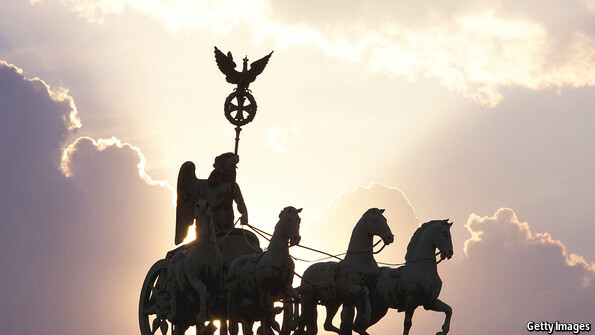 according to an opinion poll published on Monday that highlights German unease over the costs of the euro zone crisis. Efter återföreningsbubblan som lämnade dem med en svag ekonomi i ett halvt decennium. De arbetade långsamt tillbaka konkurrenskraften den hårda vägen, genom att pressa löner och driver upp produktiviteten. Det är helt förståeligt att de nu tror att Club Med kan och bör göra samma sak. a) en global boom, b) mot andra EMU-stater som inflaterade C) och med räntor som var låga även under de svåra åren. 2012 var det tre förbundsländerna som betalade in till den gemensamma kassan, Bayern, Baden-Württemberg och Hessen. then risen to be not only the elected leader of a united Germany but Europe’s most respected politician. and agreed to only after assurances that the euro would be as strong as the revered dee mark. "The 50 Days That Changed Europe"
a policy that the majority in those countries does not support? SPIEGEL: Youth unemployment in Southern Europe is above 50 percent in some cases. The austerity policies you have imposed are having disastrous consequences. It is economic logic for the eurozone to break up. But since when has economic logic played a part in the EU? The political will has shown itself to be stronger than even I imagined. Perhaps this attitude can best be summarised by a conversation I had with Angela Merkel, the German chancellor. I asked her if it would not be liberating for Greece to default and devalue its currency to get its economy back on track, as Iceland did? What she meant was, whatever the suffering, the euro must survive at all costs. when asked if she expected a deal to be forged at the meeting next week in Brussels. A crucial meeting of eurozone finance ministers next week will be key to getting Greece "back on its feet", IMF chief Christine Lagarde said, as she cut short her visit to Asia to attend the talks. 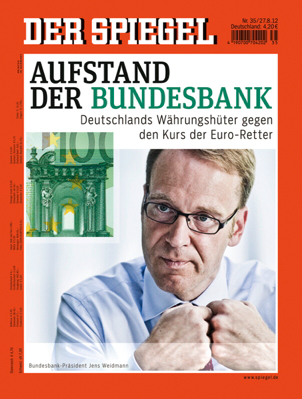 The president of the Bundesbank was once the mightiest central banker in Europe. No more. In the council of the European Central Bank, Jens Weidmann is just one of 23. He has only one vote – the same as Greece. This is the story of a historical bet gone badly wrong. After the fall of the Berlin Wall, chancellor Helmut Kohl offered the D-Mark to President François Mitterrand in exchange for French acceptance of German reunification. If the purpose of monetary union is to tie down a "European Germany" with silken cords, the Kohl-Mitterrand legacy has gone horribly wrong. after the Reunification bubble, leaving them in semi-slump for half a decade. It is entirely understandable that they now think Club Med can and should do the same. a) a global boom, b) against other EMU states that were inflating c) and with benchmark borrowing cost that stayed low even during the dog days. With Spain now front and center, the essential wrongness of the whole European policy focus becomes totally apparent. as much financial support to Germany as they have to Greece? Det är den svenska utrikespolitikens eviga fråga. Skall vi följa Tyskland eller skall vi följa England. mousey and indecisive physicist obsessed by rules and the Euro ideal. has no firm belief in anything, and is ruthlessly disloyal when it suits her. The currency union chains together economies that are simply incompatible. The problem, as European leaders understand it, is that the European Council (composed of member-states) routinely blinked when it came to penalizing violators, including Germany and France. Last week's deal supposedly makes the sanctions "automatic" by shifting enforcement authority to, of all places, the European Court of Justice. The notion that justices in Luxembourg would levy and enforce financial sanctions on an already-bankrupt member-state is obviously absurd. The actual enforcement mechanism remains what it is-the Germans' willingness to pay. 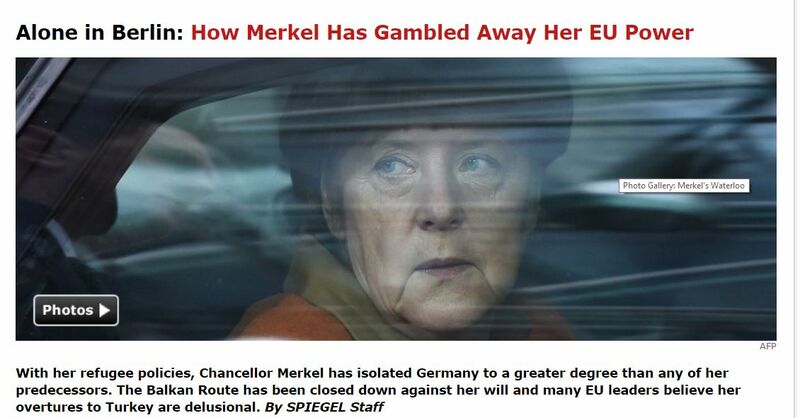 Put bluntly, credible enforcement means German puppet regimes in Rome, Athens, Madrid, and perhaps Paris. While there aren't going to be German tanks in Athens or anywhere else, the Brussels deal does illustrate the deeper, constitutional problem with heaping yet more authority on a government-over-governments. It is sometimes said that the euro’s creation was the price demanded by Germany’s European allies for supporting German reunification during the collapse of eastern European and Soviet communism. Reunification supposedly filled Europe’s Lilliputian nations with such fright that they scrambled for a means to tie down the new German Gulliver. The single currency fitted the bill. In his careful reconstruction of the political, financial and bureaucratic processes that led to the euro’s launch in 1999, Harold James demonstrates that the trail towards European monetary union was, in truth, blazed long before anyone dared even imagine the anti-communist revolutions of 1989-91. It was an aspiration first formulated in 1970 in the so-called Werner plan, named after Pierre Werner, a prime minister of Luxembourg. and that is to bring about, step by step, a political union,"
Vi har glömt det nu – och då det begav sig försvann alltsammans i allmän segeryra och Europaretorik. Men Mitterrand fick Helmut Kohl att ge upp den tyska D-marken i utbyte mot den europeiska euron. Svårt var det inte: Kohl tillhör den kanske sista generation av tyska politiker som utan reservationer sätter likhetstecken mellan tyska och europeiska intressen. Euron – “tekniskt” illa genomtänkt i vad som kallas ett icke optimalt valutaområde – skulle bli Europas nya instrument att hålla Tyskland i schack. While Germans celebrated the collapse of the Berlin Wall, Helmut Kohl and Francois Mitterand were at war over the consequences of a united Germany. Secret government documents obtained by Der Spiegel appear to show that Bonn was forced to sacrifice the Deutschmark for reunification. First and foremost, experts pointed to Italy as being the euro's weak link. The early shortcomings have yet to be corrected. It was shortly before his departure to Brussels when the chancellor was overpowered by the sheer magnitude of the moment. Helmut Kohl said that the "weight of history" would become palpable on that weekend; the resolution to establish the monetary union, he said, was a reason for "joyful celebration." Soon afterwards, on May 2, 1998, Kohl and his counterparts reached a momentous decision. Eleven countries were to become part of the new European currency, including Germany, France, the Benelux countries -- and Italy. The euro was not a German project. Quite the reverse. German voters wanted to hold on to their currency. It was pressed by those, led by France, who wanted to break the D-Mark zone. The euro was the price Helmut Kohl paid to Mitterrand to win his blessing for reunification. from a six-nation trade alliance to a 27-country behemoth with its own currency. Mrs. Siebelink tells of one summit in Strasbourg on Dec. 9, 1989, after the Berlin Wall fell, which turned out to be the day that Germany agreed to monetary union in order to get French President François Mitterand to agree to German reunification. But the difficulty of understanding the EU is that so many of its important days are not about history. The European election results showed euroscepticism rising across most of Europe. But the really shocking factor for the euro elites should have been the strength of the vote for the Front National in France. For the EU’s history – and its future – turns on France. President Mitterrand exacted agreement to the euro as the price of France’s support for German reunification. This only made sense if it was believed that the euro was in French interests and against Germany’s. Berlin had effectively united Europe under its control, with Britain all but shut out. Förbundskansler Helmut Kohl gick med på förslaget – landsmännens skepsis till trots – och ett fördrag undertecknades senare i den holländska staden Maastricht. när medlemmarna vid upprepade tillfällen tillåter sig att bryta mot reglerna, och två av syndarna är Tyskland och Frankrike, då förlorar valutasamarbetet ram och stadga. Och i en finanskris blir centralbankens passivitet och bristen på ekonomisk politik snabbt fatal. Den europeiska krisen handlar inte längre om att ge stöd till mindre länder som Grekland, Portugal och Irland. Den har övergått till vad som händer med stora ekonomier som Spanien, Italien och Frankrike om marknaderna inte lugnas. Eurokrisen är på väg att omfatta en tredjedel av hela valutaunionen eller 130 procent av Tysklands ekonomi. Inte konstigt att börsen har fallit kraftigt på sistone. Charles Wyplosz, en av Europas ledande makroekonomer, pekar i likhet med allt fler på Europeiska centralbanken. 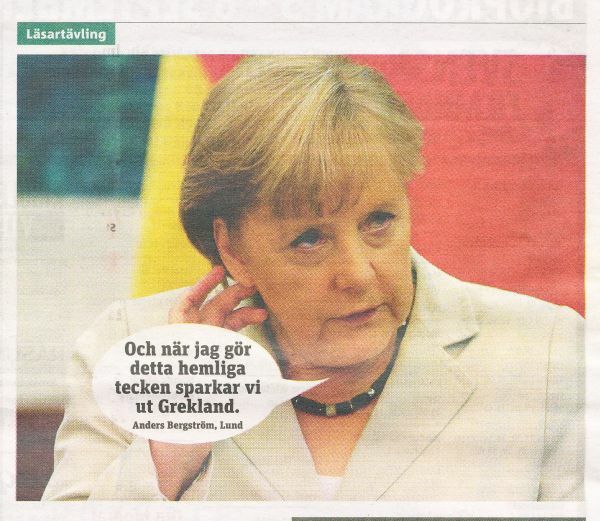 Angela Merkel, som har sin bakgrund i DDR, blev tysk förbundskansler som en konsekvens av den tyska återföreningen. Det vore en ödets ironi och en historisk galenskap om hon lät euron krascha. where so-called zombie banks weighed down with bad investments tried to improve their financial standing by simply withholding new loans. said Charles Wyplosz, a professor of economics at the Graduate Institute in Geneva. - And I would say that either we get the United States of Europe, that is an actual political union, and then that political union gets its own currency. But then it is no monetary union any longer, but the currency of that new state. Thatcher lade oförblommerat fram sin uppfattning för den man som hade makt att hindra den tyska återföreningen. Gorbatjov svarade att Sovjetunionen var väl insatt i problemet, och hon kunde vara lugn. Hans land ville lika lite som Storbritannien se ett enat Tyskland. Det var värdefullt att de båda kände till varandras syn på denna ömtåliga fråga. Till råga på allt lät François Mitterrand och fransmännen ledningen i Moskva förstå att de var inne på samma linje. Aus bisher geheim gehaltenen Protokollen geht nach SPIEGEL-Informationen hervor: Erst die Bereitschaft der Kohl-Bundesregierung, ihren Widerstand gegen die Einführung des Euro aufzugeben, ebnete den Weg zur Einheit. "Möglicherweise wäre die Europäische Währungsunion gar nicht zustande gekommen ohne deutsche Einheit." Den tyske förbundskanslern Helmut Kohl tog denna oro på allvar och accepterade tanken på valutaunionen, som ett sätt att förankra det nya starka Tyskland i Europasamarbetet. Inför hotet om ett sönderfall kan man enas om åtgärder som vanligtvis ökar EU:s överstatliga karaktär. 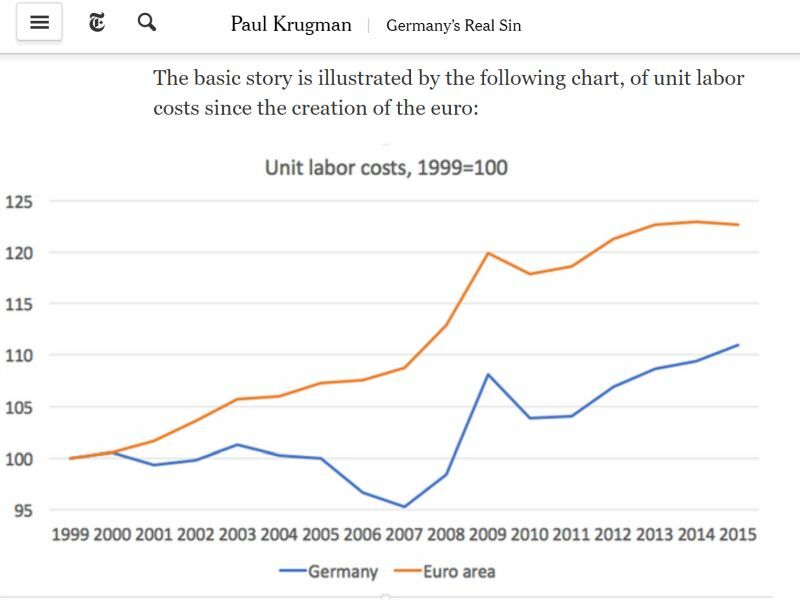 As Wolfgang Munchau pointed out in the FT yesterday, Germany entered the eurozone at an uncompetitive exchange rate and embarked on a long period of (quite painful) wage moderation and deep structural reform. Frankfurter Allgemeine Zeitung and Süddeutsche Zeitung report on the soul searching within the CDU which comes to the depressing conclusion that it is no longer able to win majorities in an urban population. ”Kärnkraften har ingen framtid... den är inte heller lämplig som en övergångs­teknologi, tvärtom står den i vägen för nya och innovativa lösningar samt en framtidsorienterad omstrukturering av energiutbudet.” Citatet kommer varken från en trädkramande Greenpeace-­aktivist, eller en miljöpartist med idéer om att framtidens välstånd ska växa på postindustriella träd. Det är IG Metall, de tyska metall­arbetarnas mäktiga fackförbund, som uttalar sig. (”vår kansler är inte gjord av stål, hon är gjord av pudding”, som Der Spiegel nyligen skrev). Förra veckan beslutade den schweiziska regeringen att fasa ut kärnkraften till 2034. Samtidigt har planerna för att bygga kärnkraftverk i Italien stoppats. Likaså i Thailand. I Sverige sitter däremot en centerpartistisk miljöminister och beklagar den tyska avvecklingen. Fredrik Reinfeldt vill inte uttala sig, och precis som statsministern påpekade: vad är det han ska uttala sig om? Det finns inget papper och inga detaljer nerskrivna än. Men faktum kvarstår: Tysklands Angela Merkel och Frankrikes Nicolas Sarkozy föreslår en ”fransk-tysk konkurrenspakt” för eurozonen. Allt ska vara bestämt om drygt en månad och nej, det finns inget papper. Någon verklig plan för hur man ska utjämna obalanserna inom EMU finns inte. Den underliggande politiska analysen handlar om att eftersom finanssektorn har orsakat krisen, så ska vanliga löntagare betala och förslaget går långt in och petar i nationella angelägenheter som kollektivavtal. Skulle det genomföras är det naturligtvis ännu svårare att se ett euro-medlemskap för svensk del. to forge a monetary union and satisfy French and British fears over its post-reunification muscle. by keeping wage growth muted in the worst years of the global financial crisis. It managed to push unemployment to record lows, but this came largely through the creation of low-paying, low-skill jobs, resulting in a decline in labor productivity, the researchers insisted. The euro may be approaching another crisis. Unionen slits just nu åt olika håll. Alternativt på god väg att förvärra situationen. EU-fantaster applåderar Macrons imperiedrömmar, men de skulle bara öka bara de klyftor som öppnat sig mellan öst och väst, syd och nord. Problemet är att ingen verkar kunna formulera alternativ med politisk kraft. EU har i drygt tjugo år målmedvetet valt en strategi som går ut på att stänga alla nödutgångar. Priset ska göras så högt att ingen vågar backa. De enda valen ska vara att låta nationalstaterna smälta samman, eller att kasta sig handlöst ut i en avgrund, utan synlig botten. This effectively reduces Macron’s grand economic union visions to the most politically harmless, and cheapest, measures. It avoids giving the Brussels bureaucracy more power, makes it unnecessary to create new taxes or pay more into the EU budget and limits the financial backstop to the direst of emergencies. Mr Scholz’s ambition is to push the budget into a surplus of 1 per cent of GDP or higher. Such a surplus would, over time, eradicate all public debt. which boasted a surplus of $9bn in 1989, just before the dictator was overthrown. The Germans made a choice. They will get what they voted for. But the policy will affect millions of people who did not have a vote because the budget will set the path for the rest of the eurozone. Central Europe looks even worse. The French president has led the way in condemning “authoritarian democracy”, an unmistakable reference to the current governments of Hungary and Poland. His frankness is welcome and bold. But it is not winning many friends in central European chancelleries. The one part of the EU where Mr Macron gets full-throated support is Brussels. In the corridors of the European Commission, the French president is regarded as a hero. 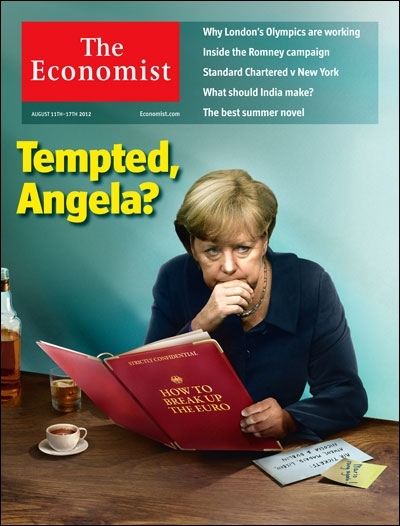 Ms Merkel does not say “no” to eurozone bonds. She says: “Not without treaty change.” The German constitutional court in Karlsruhe would never allow Germany’s sovereign guarantee to be given to its eurozone partners without them submitting to effective and centrally budgeted discipline. Germany’s council of ‘Five Wise Men’ issued a stern rebuke to the ECB earlier this month over its loose money habits. The danger is not just the “risk of excessive asset prices” but a more insidious process of “fiscal dominance” where the high-debt states become so dependent on monetary coddling that the ECB dares not tighten policy in the future. This is a classic central bank ‘debt trap’. “We’re are going to have a massive misallocation of resources and a property bubble just like Japan in the late 1980s. The negative interest rate policy and bond purchases are disastrous,” he said. The Bundesbank, the finance ministry, and the Council of Economic Experts, said Germany requires huge savings to prepare for an ageing crunch and a future collapse in the trend rate of economic growth, even if its current policies are distorting the global economic system. The currency claim may raise eyebrows in Washington, where some suspect that the European Central Bank’s negative interest rates (-0.4pc) are a disguised way to hold down the euro – bad etiquette for a currency bloc running a surplus near $430bn, three times that of China. Well, the preferred German take on the crisis at least has the merit that it requires no such rethinking of economics: indeed, emphatically the opposite. It says that the “three looses” — fiscal, monetary, and financial — spawned the crisis. And the MIT gang and their pals, having blessed a little symbolic Basel III regulatory jiggery-pokery, now say we all must double-down on the other “looses”: fiscal and monetary. i.e., the cure is, pretty much, a lot more of the same things that generated crisis in the first place! Thus, Mr Schäuble has just spent his valedictory appearance at the IMF annual meetings wishing everyone a hail and hearty farewell while prophesying doom. At this point, à la Alan Beattie, you may be inclined to hurl your favourite Martin Wolf broadside or Krugman “sadomonetarists” blog at “those #### Germans”. De ekonomiska principer som kom att bestämma västtysk ekonomisk politik redan under 1950-talet gick under benämningen "ordoliberal ekonomi". Principerna för denna tankeinriktning utvecklades först av professor Walter Euken vid Freiburg universitetet. while China’s fell to $196.4bn, or 1.7 per cent of GDP. The US had a current-account deficit of $451.7bn, or 2.4 per cent of GDP. The popular narrative of the German turnaround begins with the “Hartz reforms” — enacted from 2003 to 2005. They transformed a wildly generous system of unemployment and welfare payments, which allowed some workers to collect indefinite benefits equivalent to about half their previous salary, into one which paid fixed amounts for a limited time. Growth in employment soared, but growth in total hours worked did not. To a great extent, Germany redistributed working hours rather than created new ones. Though wages for the better-paid climbed rapidly, especially in manufacturing, they fell for the lowest-paid. The legacy of Hartz IV is a lumpen-proletariat of 7.4m people on “mini-jobs”, part-time work that is tax-free up to €450. This flatters the jobless rate, but Germany has become a split society, more unequal than at any time in its modern history. A fifth of German children are raised in poverty. Mr Macron, visiting Berlin the day after his inauguration, said that for France, too, treaty change was no longer “taboo”. Changing the exchange rate would not diminish the incentive for Germans to save. In the current European environment of near-zero interest rates, there’s little risk that additional public investment will crowd out private investment. Marine Le Pen and the death of the European project wait in the wings. That would be a disaster for Germany. Amounts to 9 pc of GDP. In early February, Germany announced a new record trade surplus: $281bn, versus $210bn for China. implied Deutschmark exchange rate to the detriment of both its European neighbours and the US. Effectively he is saying that Germany has gamed the whole European project in order to ensure extreme competitiveness for German exports. Whilst the German plebiscite may not appear so immediately headline worthy as the elections in France, the outcome could be equally binary for the fate of Europe. One of the defining characteristics of the Trumpites is that they are locked in the 1980s. They believe that the Euro is an invention by the Germans to pursue higher exports by stealth. he would answer his American critics by denying that Germany’s imbalance is at all relevant. He would take cover behind the Euro. And he would say that what matters from the US point of view is not its imbalance with Germany but its trade deficit with the Eurozone as a whole. This is tiny (c. $ 100 bn), especially when the size of the two economic blocs is considered. Indeed, if the germans were the stealth mercantilists that we generally take them to be, they would be asking Washington to stop counting the German trade surplus at all. The Eurozone balance is the only thing that should matter. Adam Tooze holds the Shelby Cullom Davis chair of History at Columbia University and serves as Director of the European Institute. He is currently at work on a history of the global financial crisis 2008-2018, which will appear in time for the anniversary in September 2018. Why are German banks the only ones backtracking on integration? One possible reason is that domestic financial authorities, skeptical about the euro’s future, have instructed banks to cut their exposure to the rest of the eurozone. German banks received €239 billion ($253 billion) in state aid between 2009 and 2015. Will the administration call for Germany’s exit from the euro? As a matter of strict objective fact, Donald Trump’s trade guru is correct. Germany is the planet’s ultimate currency manipulator. Donald Trump’s top trade adviser has said in comments that are likely to trigger alarm in Europe’s largest economy. the euro was like an “implicit Deutsche Mark” whose low valuation gave Germany an advantage over its main partners. IMF insists on debt relief, but Germany resists. which is what their own backbenchers were told. Without that lie, Greece would no longer be a eurozone member. 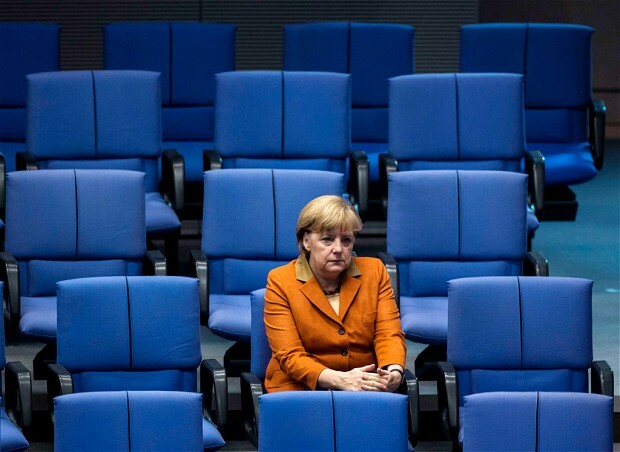 the euro zone’s anemic growth, Eastern Europe’s drift toward rampant nationalism, Brexit - keep landing in Angela Merkel’s lap. Germany’s chancellor has usually found some way to cope, most obviously by kicking each problem down the autobahn. But she lacks the power (and too often the inclination) to lead Europe, while her partners, even when they don’t obstruct her, do very little to help. So the problems drift, and frustration in Berlin mounts. over the monetary policymakers’ mass bond-buying programme. and the Netherlands, with slow growth and a massively over-indebted household sector. 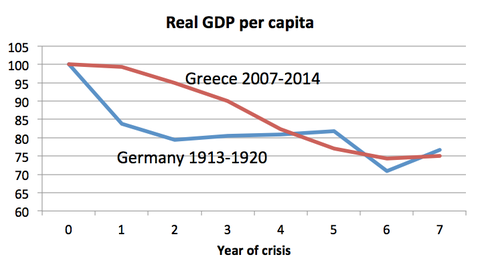 Don’t assume that Germany can sail through this crash unscathed either. Its economy has been driven by exports to China, worth $100bn a year. If China slows down dramatically, we may well find that the German economy is a lot weaker than we thought. The eurozone was in a bad enough state already. But in a bear market, fresh cracks will emerge, just as they did in 2009 and 2010 in the wake of the last collapse. if Athens did not accept the bloc’s exacting conditions for a new bailout. which is, you know, what brought you-know-who to power. Är det tyskarna som är The Good Guys inom Euroland? Athanasios Orphanides, a former member of the ECB’s governing council, said it potentially broke EU rules. and for the ECB to constrain its actions to what is best for Germany,” he told the Financial Times. The destruction of the Reichsmark’s value is an important historical lesson. But missing from that narrative is the painful deflation that followed hyperinflation. In 1923, at the height of the hyperinflation, 751,000 Germans were without work. By 1932, as deflation began to bite, unemployment hit 5.6m. legal supremacy over the sovereign state of Germany, and therefore of Britain, France, Denmark and Poland as well. If the Karlsruhe accepts this, the implication is that Germany will no longer be a fully self-governing sovereign state. - is currently blocked by the German court, the last safeguard of our nation states against encroachment. What must change is the way in which nations are treated like wayward children. and the EU’s co-founders, are fed up with being dictated to. as in the case of universally applied demand-destroying economic policies. 2015 must be the year when the eurozone’s most influential leaders lift their eyes from technocratic fixes to the wider horizons of politics. That does not mean fiscal or political union. were freely willing to take such a step, this newspaper would welcome it. But the tolerance for further integration is at rock bottom. This is due in part to the antagonising politics and contractionary policies with which the eurozone chose to confront the crisis. It is also because of the overdone claim that “there is no alternative”. The current path instead converges on a German model, not just in fiscal matters but more critically in the nature of structural reforms. Germany’s are credited with growth and employment, but they brought under-investment, precarious jobs and wage stagnation. 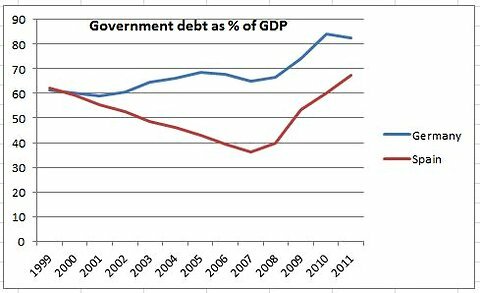 and that the eurozone’s outstanding public sector borrowings will never be repaid in full. The West German economic miracle was launched from a clean balance sheet while the Allies remained heavily indebted. Germany did not seek the euro. On the contrary, it was a price others foolishly asked Germans to pay for unification. German policy makers understood the political and economic implications of a currency union. Those of almost all other would-be members did not. The economic doctrines central to German conventional wisdom are those of a small open economy. Debt restructuring must now be on the table, starting with Greece. Ireland, similarly, should be freed of the onerous burden of bailing out the foolish foreign creditors of its banks. and have begun turning against the European Central Bank (ECB) in the struggle against deflation and a credit crunch. On all four counts, Germany is wrong. Marcel Fratzscher, a former head of International Policy Analysis at the European Central Bank, is President of DIW Berlin, a research institute and think tank, and a professor of macroeconomics and finance at Humboldt University. To be sure, Germany is justified in rejecting narrow-minded calls by France and Italy for unconditional fiscal expansion. After all, fiscal stimulus can work only if it supports private investment and is accompanied by much more ambitious structural reforms – the kind of reforms that France and Italy are currently resisting. The key to ending the European crisis is a stimulus plan that addresses deficiencies on both the supply and demand sides. That is why Germany’s refusal to help find a way to finance the proposed European investment agenda – which, for a limited time, would fund productive private investment – is a mistake. Equally problematic is Germany’s focus on maintaining a fiscal surplus. The Germans have a name for their unique economic framework: ordoliberalism.